A collection of Iconic signature combinations inspired by the GUESS lifestyle. Trendy fashion-forward designs from GUESS Watches offer dynamic styling. This masculine design features a bold black dial with chronograph sub-dials, within a black stainless steel casing and bracelet. 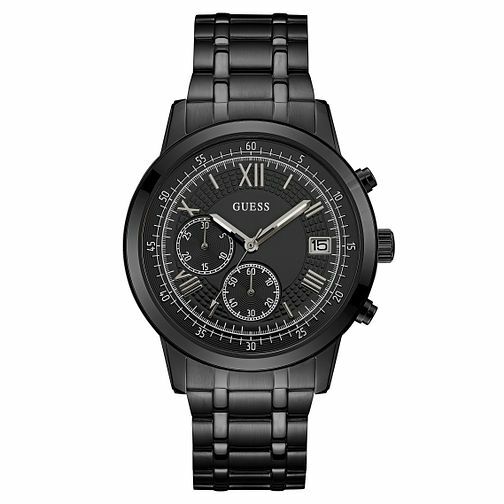 Guess Men's Iconic Black Stainless Steel Bracelet Watch is rated 5.0 out of 5 by 1. Rated 5 out of 5 by Anonymous from Stunning watch! Bought this watch for my son’s birthday. He totally loves it!! The black stainless steel strap complements anything he wears. It’s a modern style and brand .. He’s loved wearing it! !